Congratulations to Vanessa Berry, who won a pair of tickets to our upcoming Soiree for Strays spring gala! Vanessa visited our booth at the HomeStyles Home Show and generously donated to support the animals in our care. Purchase your tickets to join us on May 11th! Please join us to hear about the impact your support made in 2018 & our plans for the future. To be eligible to vote for new board candidates, please ensure your membership is up-to-date. The agenda and financial materials will be made available in person at the AGM. Please be aware that, due to our high animal population, we are currently limiting our intake of owner-surrendered pets. For information on surrendering animals, please click here. If you have found an animal, please call Saskatoon Animal Control at 306-385-7387. If you have an emergency, please call 306-668-5757. Have a wonderful long weekend!If you have found an animal, please call Saskatoon Animal Control at 306-385-7387. If you have an emergency, please call 306-668-5757. Subscribe to our Happy Tails Newsletter! 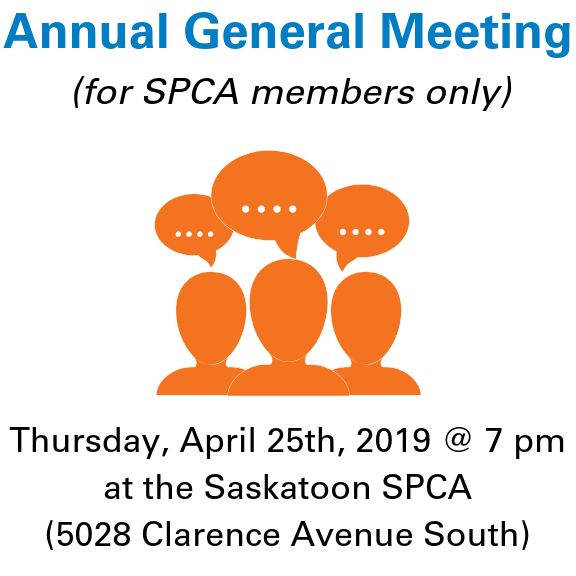 The Saskatoon SPCA Auxiliary is hosting their annual Spring Open House on Sunday, May 5th from 12 noon to 4 pm at the Saskatoon SPCA located at 5028 Clarence Avenue. Buy your tickets today for the Spring Lottery! Tickets for our annual Spring Gala, Soirée for Strays, are available now!